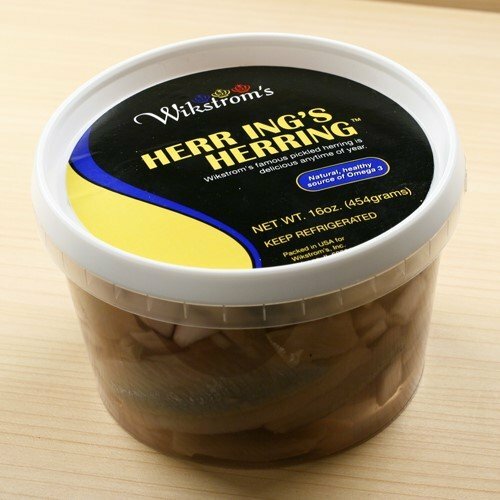 Wikstroms Pickled Herring - Original (16 ounce) by Wikstrom's Gourmet at Rae Of Sunshine Life. Hurry! Limited time offer. Offer valid only while supplies last. Marinated herring plays a unique role in the Swedish kitchen and a major role at all Swedish festivities; especially Christmas, Easter and Midsummer. Marinated herring plays a unique role in the Swedish kitchen and a major role at all Swedish festivities; especially Christmas, Easter and Midsummer. However, herring is enjoyed in Sweden all year long in the classic Swedish smorgasbord, as part of a buffet, or perhaps as a unique appetizer. What is more, herring is an immensely healthy food, containing a high level of Omega-3's. Wikstrom's pickled herring is a traditional sweet herring marinated in vinegar, sugar, red onions and spices. Available in Original or with the addition of Sour Cream. If you have any questions about this product by Wikstrom's Gourmet, contact us by completing and submitting the form below. If you are looking for a specif part number, please include it with your message.